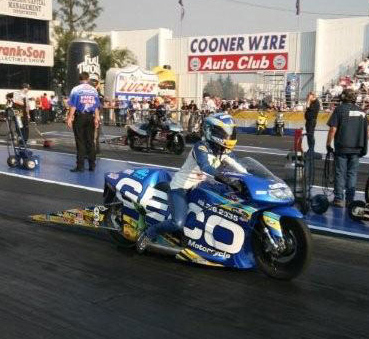 In what proved to be a season marked by unprecedented competitiveness in the NHRA Pro Stock Motorcycle category, Karen Stoffer and her GEICO Suzuki team battled its way to a fifth straight top-ten finish. 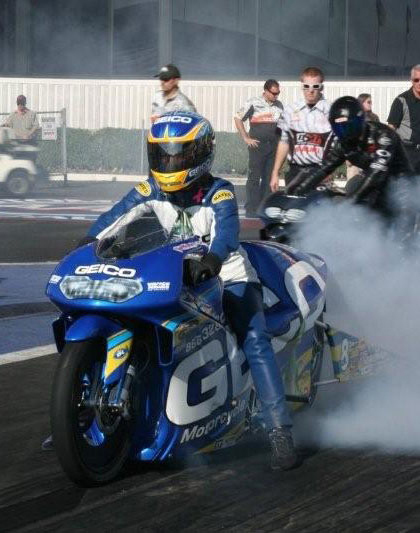 Stoffer enjoyed an auspicious start to the 2008 season by posting a career-best elapsed-time of 6.91 en route to winning the AMA Dragbike Bike Week Nationals in Valdsota, Ga.
Stoffer achieved another career milestone in late-July when she amassed her first NHRA pole position with a 6.96 at the Fram Autolite Nationals in Sonoma, Calif. Shortly thereafter Stoffer briefly fell outside of the top-ten after a few difficult races. She quickly regained the No. 10 spot after a semifinal finish in Reading, Pa. The team would then remain inside of the top-ten for the remainder of the season. Including at the illustrious U.S. Nationals on Labor Day weekend, the final race to determine the ten riders who would qualify for NHRA’s Championship Countdown. The battle to resolve the final spot in the Countdown couldn’t have been more straightforward as Stoffer was paired with a quickly encroaching No. 11-ranked Hector Arana in the opening round of eliminations. 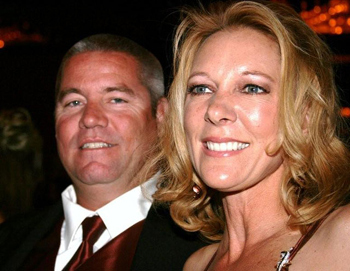 In this climatic race Stoffer came through in the clutch with her 12th career hole-shot victory. Stoffer used an .037 to .061 starting line advantage to hold off Arana with a 7.019 to Arana’s quicker 7.017. Stoffer finished the season with a No. 5 qualifying effort and a first round victory to vault her to the No. 9 spot in the series. Team owner Doug Johnson felt the team made great improvements throughout the season despite some tough luck on Sunday. Johnson says the off-season will be a busy one. Stoffer shares Johnson’s optimism for the 2009 season. 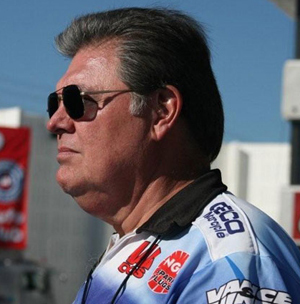 Stoffer will begin the 2009 season at the AC Delco Gatornationals from Gainesville, Fla., March 12-15. Geico Motorcycle Insurance 1-800-44-Cycle, Speed Dawg, Bates Leathers, NGK, Airtech, Wrath Motorsports, Square One Graphics, Suzuki Extended Protection, and Kymco.